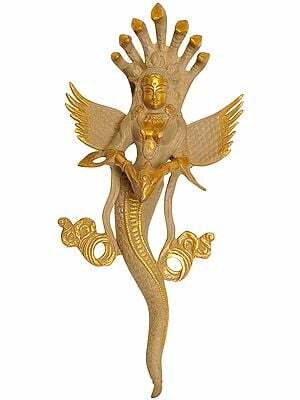 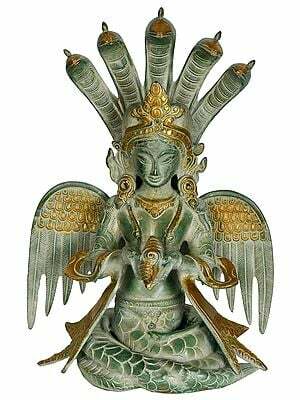 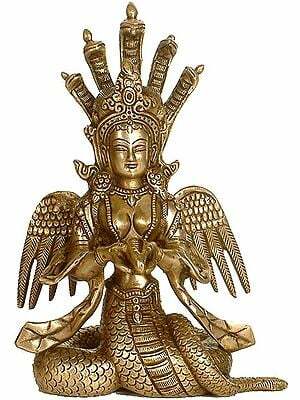 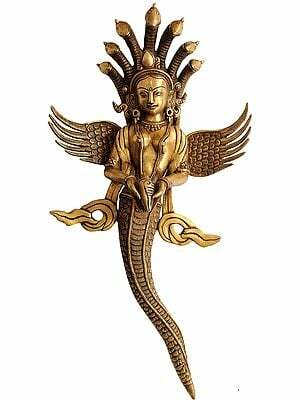 This brass-statue represents a winged Naga-kanya, a maiden with a serpent’s lower half. 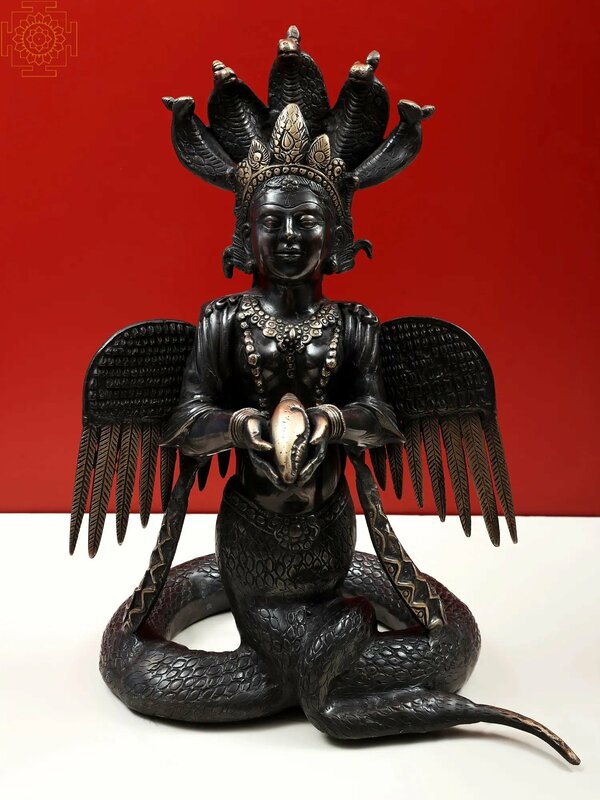 Almost all ancient mythologies world-over comprise the concept of half man-half serpent and half maiden-half serpent, often interacting with the world of man. 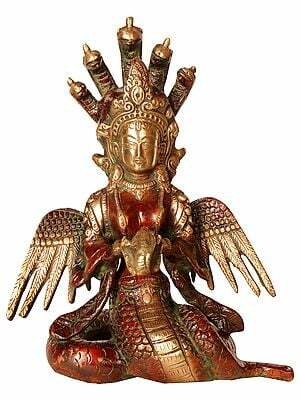 As regards the cult of man-serpent mixed forms, Indian mythology is far more elaborate though strangely while it talks with definiteness about different serpents and their lineage, about seven-eight of them being major having well defined line, role, personality, lands they ruled or influenced, and their related myths, it is almost conspicuously silent about Naga-kanyas except sometimes as wives of these Nagas or in some minor mythological contexts. 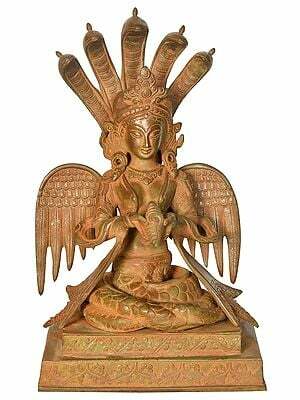 Ananta or Shesh, Vasuki, Takshaka, Karkotaka, Padma, Mahapadma, Shankhapala, Kulika among others are the names of some of the multi-hooded serpents, each heading a line, and each capable of taking to any form. 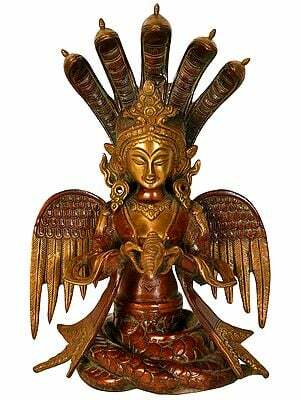 Ananta, Vasuki and Takshaka are said to have been five-hooded. 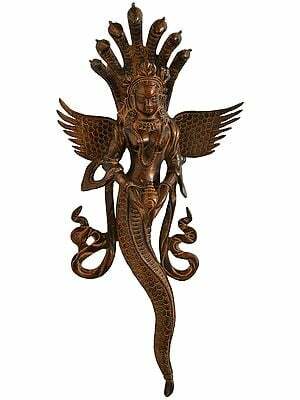 Maybe, the artist has conceived this five-hooded Naga-kanya as the wife of one of them. 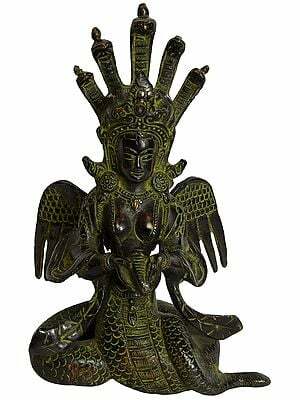 This Naga-kanya statue blends three forms – woman, viper and bird. 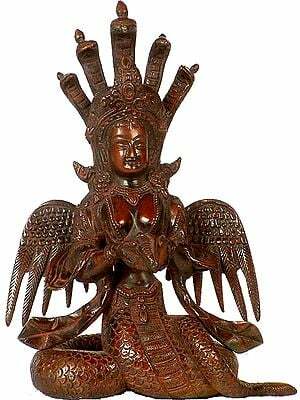 With their exceptional beauty Naga-kanyas have been conceived mostly as ‘apsaras’ – nymphs, the creatures of ocean as well as sky, and hence, often perceived as having wings, besides the serpent part. 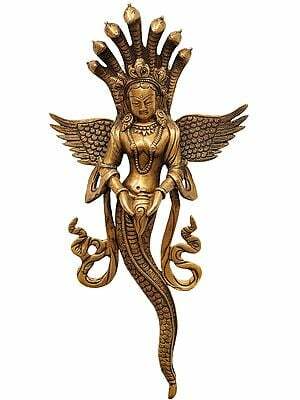 The figure’s lower half, below the waist, is a mighty serpent. 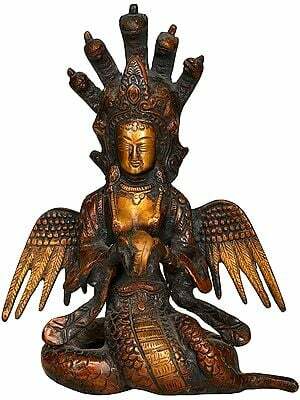 It is so massive in breadth that the figure’s upper part seems to emerge out of it. 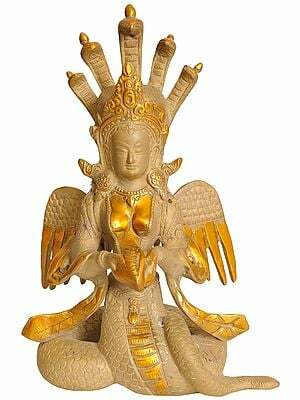 Except her five hoods over her head, the upper half of the statue is an absolute woman with fine features and glowing face, young, vigorous, beautiful or rather sensuously modeled. 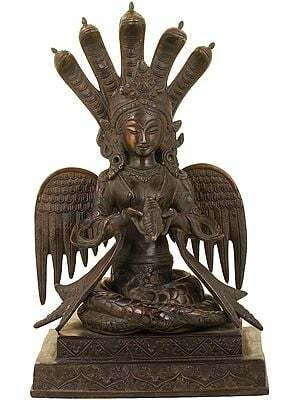 Unlinked with the statue’s lower serpent-part the five hoods, more like a thing grafted rather than something grown over her head, serve as her crown without distorting her form as a woman. With a conch in her hands the figure of the Naga-kanya is obviously in the prayer mode making an offering. 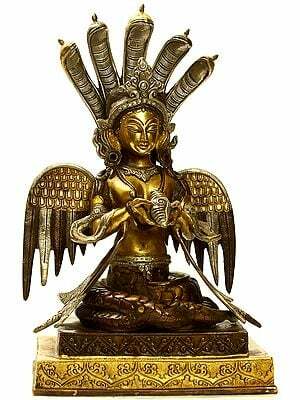 Though the deity, the offering is made to, is not known, the conch being Lord Vishnu’s attribute, the Naga-kanya might be seen as offering it to him. 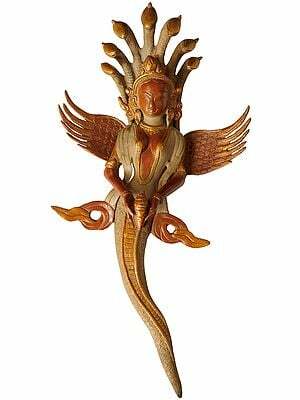 Being a creature of the ocean, and the conch, ocean’s product quite within her reach, for the Naga-kanya the conch might have been the most natural thing to offer to Lord Vishnu. Perhaps a forgotten context in a myth or legend, the Naga-kanya is seeking to please Lord Vishnu so that he commands the Great Bird Garuda, his vehicle, not to destroy the Nagas’ race. 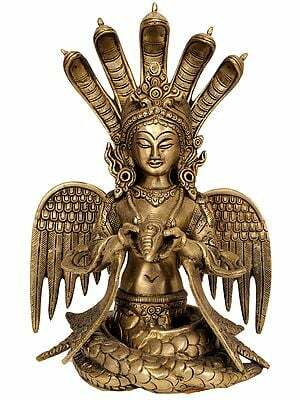 Mythical bird Garuda, something like a divine transform of eagle, is serpents’ traditional enemy. 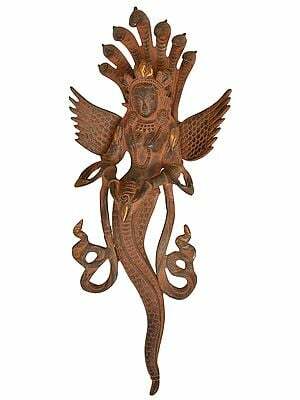 Maybe, the image refers to the mythical occasion when principal Nagas, perhaps with their consorts, went to Brahmadeva – Vishnu, seeking his intervention in the Sarpa-yajna – a sacrificial ritual, performed by Janameyaja, a context comprising part of the great epic Mahabharata. 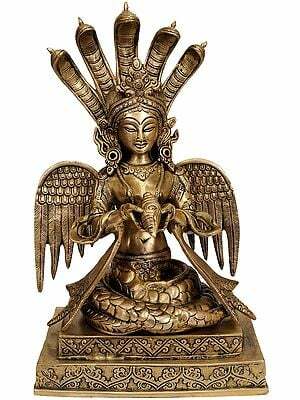 Mythology refers to numerous Sarpa-yajnas performed from time to time seeking to eliminate serpents. 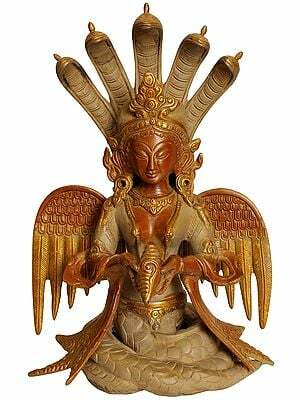 The statue might also be seen as representing an occasion from any of these other Sarpa-yajnas.